3 Reasons To Bring Your Laptop To The Seder: For the first time in 30 years, neither of Abq Jew's kids will be home for Pesach. Skyping them home is the #1 reason Abq Jew may bring his laptop to the seder. The #2 reason is 300 Ways to ask the Four Questions. 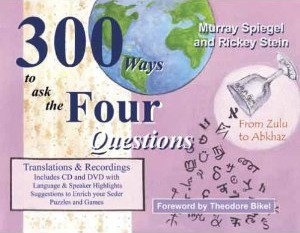 The result of a quest by two friends (Murray Spiegel and Rickey Stein) passionate about Judaism, Passover and languages, this book shows translations of the Seder's Four Questions into hundreds of languages spanning the globe. Theodore Bikel raves that he "takes great delight in this book." What a hoot! Where else can you read and hear (via accompanying CD & DVD) the Fir Kashas translated into Urdu, Mongolian, Klingon, and Valley Girl? Click here to visit the authors' web site (http://whyisthisnight.com - of course!) and order directly from them. Or click here to order from Abq Jew's Amazon Store. The #3 reason to bring your laptop to the seder is this terrific video from Aish.com: Google "Exodus" To Get Out Of Egypt!